"Thanks for the Memory" (clip) from THE BIG BROADCAST OF 1938 (1938) sung with Shirley Ross (a .MP3 file). "Original Theatrical Trailer" from THE PRINCESS AND THE PIRATE (1944) with Virginia Mayo, Walter Slezak, Walter Brennan and Victor McLaglen (a .MOV file). 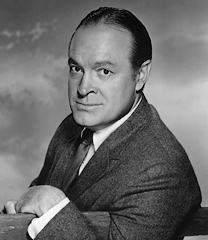 TVNow's monthly Bob Hope schedule -when his films will be on TV.